We have this set, Riley went through a Cars phase and loved it, but we paid full price..this is a great deal, buy now and save for Christmas! 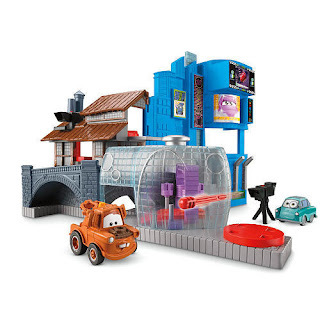 Product Description Boys will love playing out their favorite movie moments with this new Fisher-Price Imaginext Disney Pixar Cars 2 Tokyo and Villain Playset! The Fisher-Price Imaginext Disney Pixar Cars 2 Tokyo and Villain Playset features include: Mater, Professor Z and projectile-launching camera and a snap-on spy accessory piece It consists of two sides of the movie: the villainous minion lair and the city of Tokyo! On the Tokyo side, place a car in the activation disk on top of the playset and watch the window change from McQueen to Francesco Place a car in the activation disk by the Tokyo museum, turn the disk and watch the car in the secret bathroom move back and forth! On the back of the playset, place Mater in the secret spy headquarters and attach his spy accessory On the minion side, drive a car over the ramp and from the side of the playset, slide up the lever to reveal the infrared, projectile-launching camera! Inside the minion's lair boys can interrogate vehicles by turning the activation disk to rotate the saw! I agree. This toy is really adorable. It reminds of the movie Cars 2. They get every details in this toy. You can really enjoy and have fun. For sure my little brother will love this too if he see it.